Uncover the ancient secrets of Egypt long buried in desert sands while experiencing the welcoming culture of today. See the pyramids from astride a majestic camel. Wander among 140 soaring pillars in Karnak Temple. Explore Dendera, one of Egypt's best-preserved and less-frequented temples. Feel the Nile breeze on your cheeks as you skim its waters by traditional felucca. Delight in the fragrances of Aswan’s spice market. Join Viking and our expert Egyptologists on a 12-day Nile cruise & tour into the heart of Egypt. Book by 31st July & save £750 per person plus free gratuities! * Call 0800 810 8220 to secure your cabin! Arrive in Cairo, Egypt’s exhilarating capital. This pulsating, historic city was made prosperous over millennia as a stopover for Sahara caravans on trade routes to Byzantium. You will transfer to the First-Class Ritz Carlton Nile (or similar) for a 3-night stay. This morning we take an excursion to the necropolis at Sakkara to see the world’s oldest step pyramid. After a typical Egyptian lunch, continue to the Giza Plateau to behold the only Wonder of the Ancient World still standing: the Great Pyramids of Khufu, Khafre and Menkaure. There, you can experience them as the ancients did—from astride the “ships of the desert”—during a brief camel ride. Nearby, see the Great Sphinx, forever facing due east. Return to your hotel for dinner and a free evening to relax or explore on your own. Early this morning, fly to Luxor, the ancient city of Thebes beautifully set on the Nile River, where history will be brought to life by your expert Egyptologist. 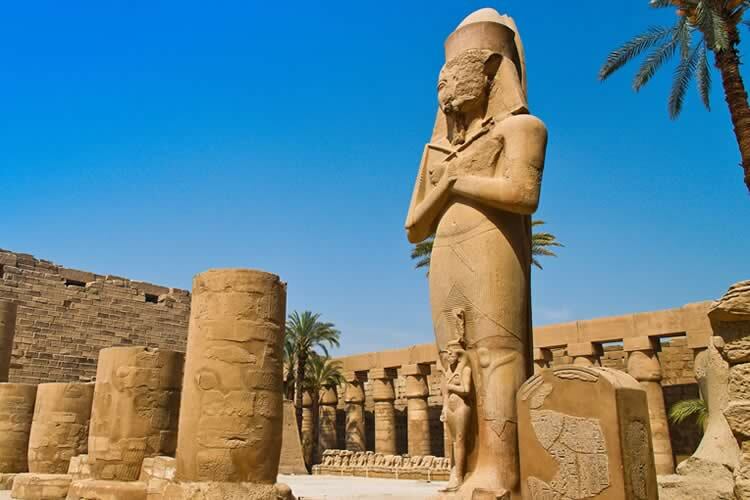 At the Temples of Luxor and Karnak, long buried beneath desert sands, walk among monumental peristyles and obelisks and learn how ancient hieroglyphics hint at the beliefs and lifestyle of ancient Egyptians. Proceed to your Nile cruise ship for check-in and a welcome lunch. Join an optional excursion to the Luxor Library and Heritage Center, where the city’s past is preserved and shared in engaging exhibits. Enjoy an onboard dinner. Relax over breakfast, or (weather permitting) join an optional early-morning hot air balloon ride over Luxor’s temples and monuments. You’ll marvel at breathtaking views of an ancient city, the surrounding desert sands and the magnificent Nile. Later, head to the Nile’s west bank to visit the Valley of the Kings, where ancient pharaohs were entombed deep in the hillsides, and the Valley of the Queens, resting place of pharaohs’ wives. Here you will enjoy Privileged Access to the tomb of Queen Nefertari, an exquisitely preserved tomb only a few visitors get to see. Among the sites you’ll visit are the Mortuary Temple of Queen Hatshepsut, one of Egypt’s few female rulers and most successful pharaohs. Return to your ship as we set sail for Qena; lunch and dinner are served on board as we cruise along the spectacular Nile. This morning’s excursion takes you to the sprawling complex of Dendera. Remarkably, its fascinating Temple of Hathor was not built by the ancient Egyptians, but by Ptolemies and Romans in classic Egyptian style. During your tour, you will walk through its towering stone gate to view the columns and hieroglyphics of some of Egypt’s best preserved structures. After a guided visit and time to explore on your own, you will return to your ship. Disembark at Esna today to explore the red sandstone Temple of Khnum. In the 1st-century Hypostyle Hall, admire its 24 columns, six across and four deep, each topped by a differently designed, intricately carved floral capital. As you explore, be sure to examine the hieroglyphics depicting Roman emperors making offerings to the gods. After a guided tour, you will have time to take in more of this fascinating site on your own. Awake in Aswan this morning, Egypt’s bustling market city. You will have the morning to explore on your own, or join an optional excursion to Abu Simbel to admire the Great Temple of Ramses II, Egypt’s longest ruling pharaoh. It is dominated by four colossal statues, sixty feet high and directly facing the rising sun. The statues are all of Ramses, with his queen and daughters at his feet. Moved from its original location near Aswan to save it from the rising waters of Lake Nasser, it was built as a tribute to the deities and Ramses II’s favorite wife, Nefertari. This afternoon, take a scenic Nile cruise on a felucca, a traditional Egyptian wooden sailboat, and visit the local spice market. 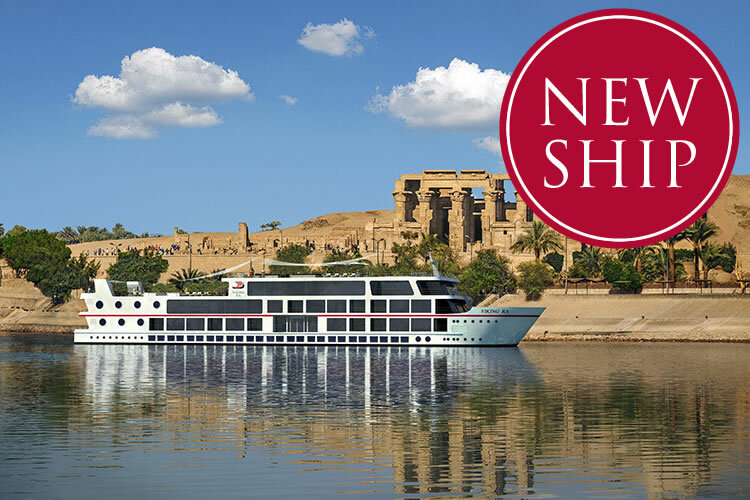 Enjoy an onboard dinner and spend the night in Aswan. After breakfast, visit the small, elegant Temple of Isis, rescued from the rising waters of Lake Nasser that submerged Philae Island. This temple is one of the Nubian monuments that comprise a UNESCO World Heritage Site. You’ll also see the Aswan High Dam, completed in the 1960s. Then receive a warm welcome at a Nubian village, where you will visit the elementary school and be invited into a local home to get a glimpse of day-to-day life. Have lunch on board as you enjoy scenic cruising along the Nile. Disembark later to explore Kom Ombo. Here, enjoy a guided tour of the unusual double temple dedicated to the sky god Haroeris and the crocodile god Sobek, a protective deity thought to have created the world. This morning, ride in a horse-drawn calèche, or carriage, to the Temple of Horus. Dedicated to the falcon-headed god of light, it was built in Edfu during the Ptolemaic Dynasty. This is another of Egypt’s best preserved temples, fronted by a massive wall whose entrance is flanked by two falcon statues. Enjoy more Nile cruising today, marveling at the lush green riverbanks backed by hills of desert sands. Arrive back in Luxor later, and join an optional sound and light show at the Temple of Luxor this evening. After a leisurely onboard breakfast, disembark and head to the airport for your flight back to Cairo. Check in to the First-Class Cairo CityStars Hotel (or similar) for 1 night, then enjoy free time. Return to your hotel for dinner and an evening at leisure. After breakfast, proceed to the airport for your return flight. Terms and conditions apply. All offers are subject to availability and operators booking conditions. Prices are based on two passengers sharing the lead in grade stateroom unless otherwise stated. All savings are included in the fares shown and were correct at time of print, but are subject to change. ^Itinerary operates in reverse, please call to confirm. *Savings of £750 per person and free gratuities are applicable to new bookings only made by 31st July 2018. We charge a one-off small £20 booking fee. That’s it - nothing more and no add ons when you pay the balance. E&OE. ABTA P6710.